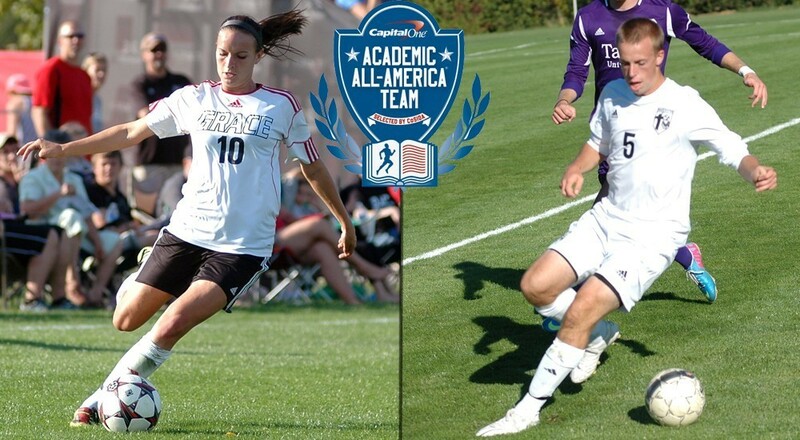 Holly Bennett and Kyle Hamlin, soccer players at Grace College, Winona Lake, Ind., were each selected to the prestigious Capital One Academic All-America® Second Team on Thursday. Bennett and Hamlin represented Grace on their respective 11-player teams in the College Division, as selected by the College Sports Information Directors of America (CoSIDA). The Academic All-America Teams were chosen based on both academic and athletic achievement. Holly Bennett, a junior midfielder from Morton, Ill., has a sparkling 3.97 GPA as a communication and youth ministry major. She currently ranks in the top 10 for Grace in career goals, career assists and career points. So far during the 2013 season, she has tallied four goals and six assists, ranking second on the team with 14 points. She tallied a goal or an assist in four of Grace’s Crossroads League games. The Lady Lancers clinched a berth to the 2013 NCCAA National Championships in Kissimmee, Fla., with a 2-0 victory over Cedarville on Saturday. Kyle Hamlin, a sophomore midfielder/forward from Tipp City, Ohio, picked up Second Team All-America recognition as a mathematics major with a 3.93 GPA. He co-led the Lancers with seven goals in 2013 to go along with two assists. He has tallied 14 goals over his first two seasons for the Lancers. Hamlin has two-game winning goals in 2013.